Radioactive water has leaked from a storage tank into the ground at Japan's Fukushima plant, its operator says. Tokyo Electric Power Company (Tepco) said the leak of at least 300 tonnes of the highly radioactive water was discovered on Monday. The plant, crippled by the earthquake and tsunami in 2011, has seen a series of water leaks and power failures. The tsunami knocked out cooling systems to the reactors, three of which melted down. 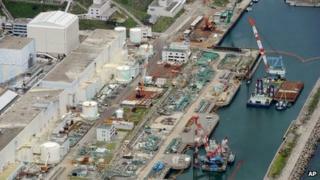 An employee discovered the leak on Monday morning, Tepco said in a statement. This is believed to be the fourth major leak from storage tanks at Fukushima since the tsunami in 2011 disabled the nuclear plant and necessitated the constant pumping of water to cool the reactors. Tepco says this is the worst so far in terms of volume - and it is also highly radioactive, with levels in the leaked water of 80 million becquerels per litre, some eight million times above the limit for drinking water in Japan. So far just four tonnes of this water has been recovered. The concern is that the rest will leach into the sea which is just 100m away. However, while this latest development is a concern, the scale of the overall radiation leakage at Fukushima must be kept in some perspective. According to Dr Ken Buesseler, a senior scientist at the Woods Hole Oceanographic Institute, the total amount of the radioactive element caesium produced since the disaster began at Fukushima is roughly equal to the amount that has been emitted at Windscale/Sellafield since operations began there 60 years ago. Officials described the leak as a level-one incident - the lowest level - on the International Nuclear and Radiological Event Scale (Ines), which measures nuclear events. This is the first time that Japan has declared such an event since the 2011 earthquake and tsunami, however. Under the Ines, events have seven categories starting with Level 0 ("without safety significance") and Levels 1-3 denoting "incidents" while Levels 4-7 denote "accidents". A puddle of the contaminated water was emitting 100 millisieverts an hour of radiation, Kyodo news agency said. Masayuki Ono, general manager of Tepco, told Reuters news agency: "One hundred millisieverts per hour is equivalent to the limit for accumulated exposure over five years for nuclear workers; so it can be said that we found a radiation level strong enough to give someone a five-year dose of radiation within one hour." A Tepco official told a press conference on Tuesday that the water probably leaked from a tank after escaping a concrete barrier. Workers were pumping out the puddle and the remaining water in the tank and would be transferring it to other containers, Kyodo added. Water is being pumped into the reactors after cooling systems were knocked out by the tsunami. Hundreds of tanks were built to store the contaminated water. Some of them had experienced similar leaks since 2012, but not on this scale, a Tepco official said. Tepco had been instructed to retrieve contaminated soil and to strengthen monitoring of the surrounding environment, a regulatory official told Agence-France Presse news agency. No major changes in radiation levels outside the plant had been observed so far, the official added. The incident comes days after Tepco admitted that as much as 300 tonnes of contaminated water a day was leaking from the damaged reactor buildings to the sea.